Educational Philosophy: Many of the preschools follow a prescribed learning philosophy and it is important to choose one that best suits your family values. Ask questions about the philosophy, why did the school choose this philosophy, and how is it applied in the classroom? What are the benefits to the philosophy verses another philosophy? Is the school licensed? Accredited? Teachers: The fond school memories we hold as adults are often a direct correlation of the teacher and classroom experience. Be sure to gather information on the faculty and staff, meet with prospective teachers, ask about their educational background, observe a class and see the interaction between the teacher and children. School - Family Partnership: “It takes a village to raise a child,” says an old adage. Entering into a partnership with a school, where the child’s success is first and foremost, is a vital ingredient in selecting a preschool. The mutual and trusting relationship that forms in these formative years will provide families with a strong support system for years to come. Do clarify how the school and family will communicate with respect to a child’s progress and development, how often will this communication occur, what will be communicated and who will be communicating. Safety First: Ask how the children are kept safe and properly supervised. Are there emergency drills; is there a security system, if the faculty and staff trained on first aid, what is the allergy protocol, what is the sick policy, etc.? Most, if not all schools, will have all these systems in place to keep children safe. Location, Cost and Family logistics: Be sure to consider where the school is located, the cost and the effect on your family day to day logistics. It is a wonderful time in your life and in your child’s life; enjoy the journey as you plan and research the preschool of your choice. 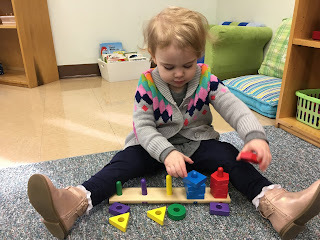 What do stacking blocks and doing puzzles have to do with algebra and reading? There is a growing amount of research linking early exposure and understanding of spatial reasoning with future success in those subjects. Children who can manipulate objects, match patterns and sort objects develop the spatial and reasoning skills necessary to later tackle more academic tasks. This concept was one that Dr. Maria Montessori saw to be true decades ago. 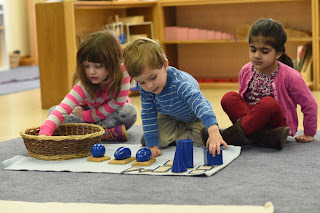 She noticed that not only were preschool aged children interested in exploring shapes and discriminating objects by their size, color, similarities, and differences but that the earlier they were exposed to these hands-on activities, the easier it became for them to extrapolate the rules of mathematics and language. The Pink Tower and Brown Stair are each sets of 10 blocks that change in size and weight incrementally. As children stack or sort them they must use their discrimination skills to correctly order them. These cylinders (each in sets of 10 again) change in height, width, or a combination of height and width, requiring a detailed eye to arrange or match them. The Binomial Cube is a puzzle that requires attention to detail of height, width, length, and color to put together. The cube itself also represents the algebraic representation of (a+b)3 = a3+3a2b+3ab2+b3, a concept not introduced until the elementary years. The Geometric Solids provide an opportunity for children to explore different three-dimensional objects to discover the differences and similarities between such shapes as a triangle-based prism and a rectangular-based prism. Parents often ask how they can support Montessori principles at home. 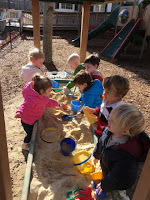 One of my favorite quotes from Dr. Montessori is “Never help a child with a task at which he feels he can succeed." 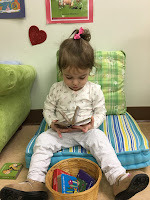 Keeping this in mind, here are some tips from The American Montessori Society for developing independent, capable, responsible, young people in collaboration with your child’s Montessori school experience. Having a place for everything, on a child-friendly scale, encourages both independence and self-discipline. Children know where to find what they need and where to put it when they’re done. An ordered environment also has fewer distractions, allowing children to focus on the task at hand. · Provide shelves or drawers for clothing; lower the rod in the bedroom closet. · Put healthy snacks and foods on a low pantry shelf so your child can help himself. · Pour drinks into small, manageable pitchers placed on a low refrigerator shelf. Keep cups within your child’s reach – along with a sponge to clean up spills. Montessori students are taught to take care of themselves and their classroom and to be helpful to others. Having your child help at home can bring similar rewards. Take time to teach each skill separately and to repeat the lesson as needed. 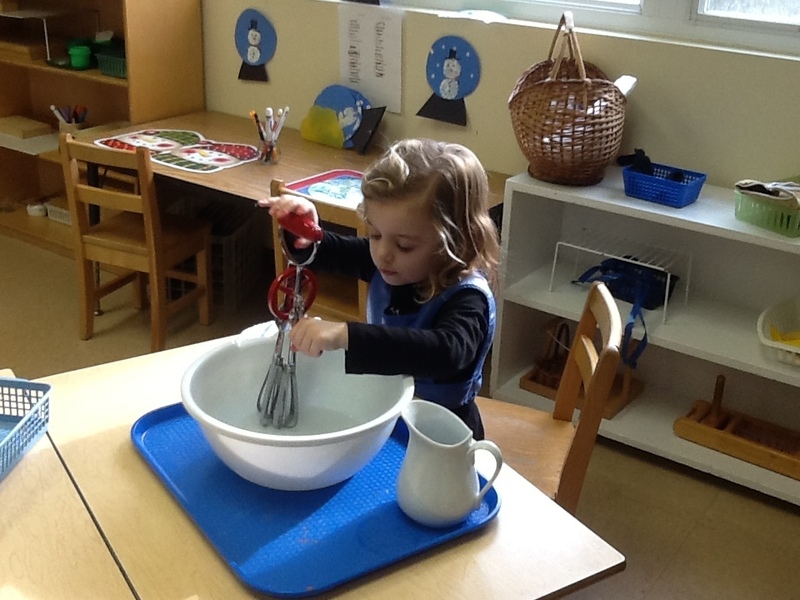 · Each task your child masters adds to his confidence and self-esteem. · Young children, for example, can peel vegetables, fold their socks, and care for pets. The ability to focus and concentrate is an important skill for learning. You can help develop your child’s concentration by observing what sparks her interest. Set her up with the means and materials to explore it. And let her work without interruption. While your child’s work environment should be free of distraction, it doesn’t have to be away from family activity. Some children prefer working at the kitchen table or reading in a cozy corner of the living room to holing up in a bedroom or study. Observe your child’s response to various environments, ask questions, and make adjustment as needed. When we step back and think of community, our first thought is of a geographic location, or a myriad of homes, or our very own street. As we delve a bit more, we realize that community is so much more – it is a feeling of fellowship with others, sharing some common threads and goals, and giving of ourselves to maintain the bonds. 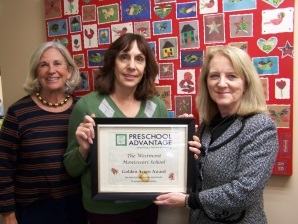 The Westmont Montessori School, has been part of the greater community for 52+ years. 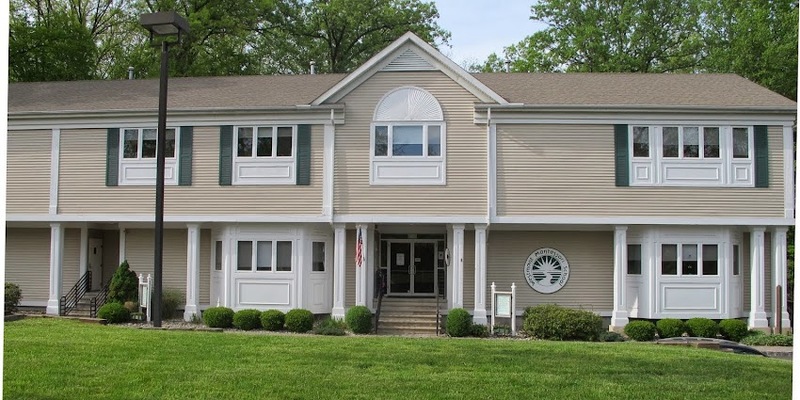 It was through generous gifts by local families, a set of dedicated parents, a Board of Trustees, and a strong vision, that Westmont came to open its doors for families who desired a quality preschool education. Our collaboration continues through the support and participation of local sports teams, the annual Mendham Harvest Hustle, support of local business and tourism associations, and the Westmont Parent Education Speaker Series. The seeds born from the generosity of gifts from more than 50 years ago continue to bloom. 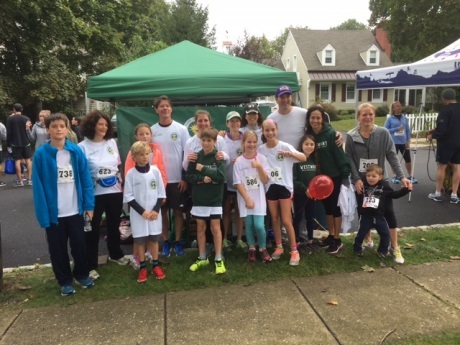 Today, we impart this community spirit of kindness, caring, and collaboration through our Montessori philosophy and our day-to-day role modeling in the classroom.